Our patio now has a new addition. Snookball is a new and innovative soccer pool game that is a blast to play! This game is great for parties or a little 1 on 1 play. For reservations email us: info@jjqs.ca or call (905) 607-2582. Thursday $5.00 Pints at JJQ’s Billiards & Lounge. 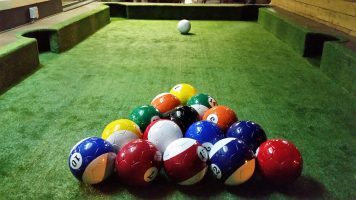 Thursday at JJQ’s Billiards: OPPL Pool League Accepting New Players (3 person teams). TAPP Pool League Accepting New Players (5 person teams). Thirsty Thursdays: $4.00 Pints (from 11:30am – 2am). Great league to meet people (men and women). All skill levels are accepted.